Ra Heru Khuti and his supporters, (Babkunda-keeper of the Marshlands, Sekhet and Bast, Mangala Kum Ra, Khianga-the Cushite, Kheperaungkhti-the blind sage, and Net Ra), attack the City of Avaris to recover the stolen Papyrus Am Tuat and free Ausara-Kheperaungkhti’s daughter and heir to the ancient kingdom of Kalakun. The City of Avaris counter attacked re-capturing the Papyrus Am Tuat which Sethe needed in order to awaken his evil genius grandfather, Mortimer Sethe. During the battle Ra HeruKhuti has adventurous encounters with Headless Seb, the Shemsu Heru, and the Shemsut Auset warriors in their combined attempts to defeat the evil Sethe. Ra Herukhuti and his allies are on the brink of defeat when the unexpected happens. In addition, the powerful Ashemu warriors intervene. 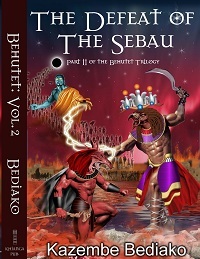 Read Behutet: Defeat of the Sebau for details and to find out what happens!